Orange Sunrise Rotary welcomed a dozen Past District Governors of District 5320 to a VIP reception on April 15th, where member Rae Shirer was announced as the Governor Nominee for Rotary year 2013-14. The reception was originally intended as the club’s annual “thank you” event for sponsors, supporters and volunteers of the Orange Plaza Car Show. The car show crowd mingled with Rotarians and enjoyed the terrific food and drink at PJ’s Abbey in Old Towne Orange. Rae served as President of Orange Sunrise in 2006-07 and has been involved with District events since 2005, when her Rotary sponsor John Bouyer pulled her onto the District Conference committee. She currently serves as the District Secretary. This entry was posted in Club Service, Member News on April 15, 2010 by Rae. Orange Sunrise Retakes Elwyn Bowling Pin! President Rae Shirer celebrates with team captain John Bouyer Orange Sunrise recovered bragging rights as the Rotary Challenge Champion, winning the title at the 12th Annual Elwyn California Bowl-a-Thon on April 3, 2010. Orange Sunrise sponsored two teams, determined to beat last year’s winner, the Rotary Club of Tustin-Santa Ana, as well as teams representing the Rotary Clubs of Anaheim Hills, Newport-Balboa, and Newport-Irvine. Rotaract participated as well, with representatives from Long Beach and UC Irvine on hand for the challenge. 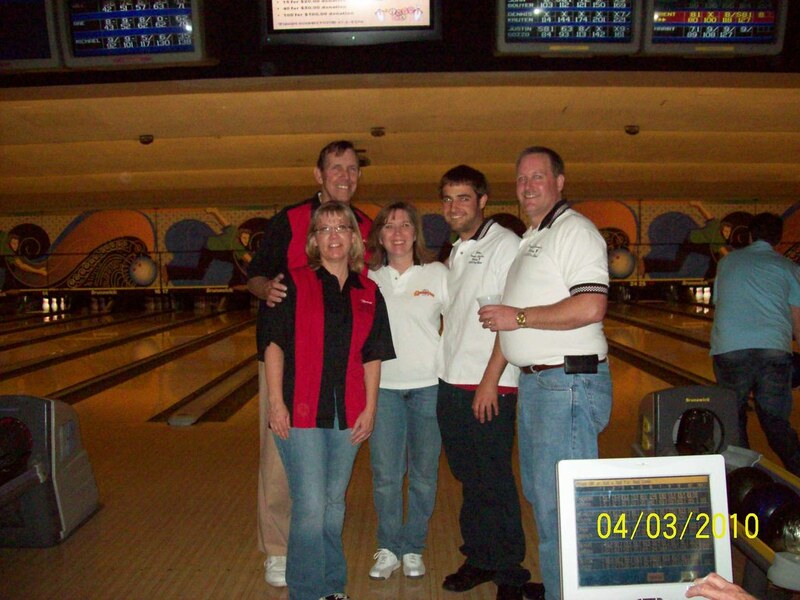 The friendly rivalry raised big cash for Elwyn which provides vocational training and job placement for the disabled. 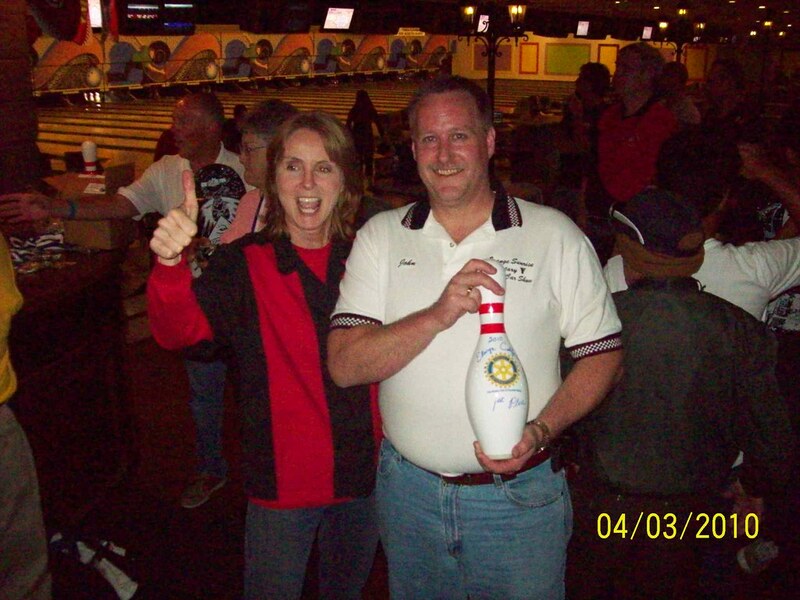 All 60 of the bowling centers lanes were sold out and attendees bid on great silent auction items and raced to win prizes for producing such things as a hunting license or displaying the hairiest arm. Two prizes were awarded in the Rotary challenge class. Defending champion Tustin-Santa Ana made a valiant effort, placing second. The champion team: Dennis Kauten, Michelle Kauten, Theresa Bouyer, Justin Gozzo and team captain John Bouyer. This entry was posted in Community Service, Just for Fun!, Vocational Service on April 3, 2010 by Rae. Orange Rotarian Bob Meyer visited Orange Sunrise on March 31st to update the club on the efforts of Operation a Bit of Home. The organization was founded by Bob’s son Ken, whose wife Angel reported shortages of basic necessities during her active military service. Bob told the club that our troops in the middle east had gone without laundry detergent for 40 days and that no supplies were expected from military sources. Orange Sunrise immediately joined with other Rotary clubs to purchase and ship soap. Bob left the meeting with a check for $250. For more information about how you can help our troops, visit the Operation a Bit of Home website. This entry was posted in Vocational Service on March 31, 2010 by Rae. 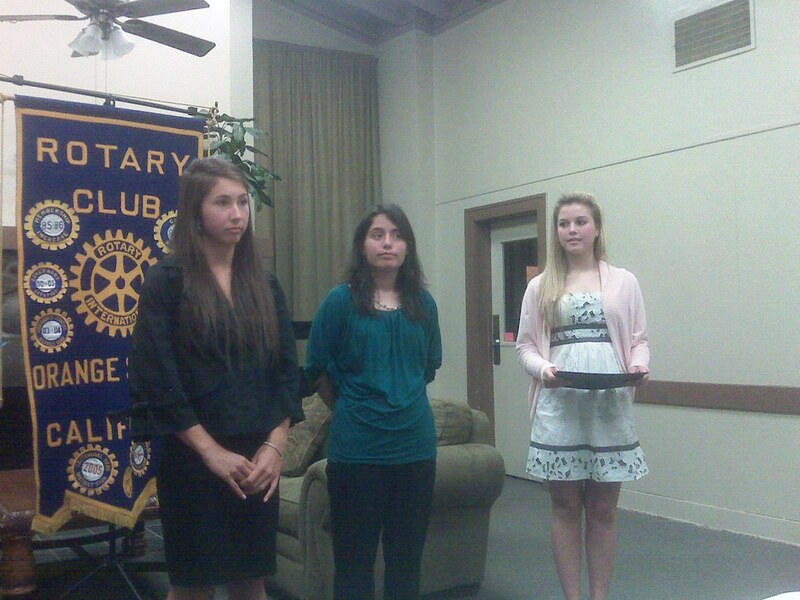 Three El Modena High School juniors were selected to attend RYLA leadership camp April 23 to April 25th, 2010. RYLA is held annually at Idyllwild Pines in the San Bernardino mountains. Nearly 300 high school juniors, selected by all of the clubs of Rotary District 5320, attend the weekend event. The goal for Orange Sunrise Rotary in choosing students to attend RYLA is to select students whom we felt were looking for leadership positions in their school/community but did not quite have the skills, confidence, and understanding of what it meant to BE A LEADER. The club worked with the El Modena’s Interact Club and the Technology Academy to select a group of students as candidates for an interview. The interview process was extremely important, and our goal was not to send the charismatic, goal-oriented student to RYLA, but to find those students who expressed a genuine interest in building their own self-confidence and leadership skills. We choose three students from the Technology Academy and helped them get ready for an experience they would never forget. For more information about RYLA, visit the Rotary District 5320 website: http://rotary5320.org/service-opportunities/ryla. This entry was posted in Youth Service on March 29, 2010 by Rae. Six Orange Sunrise Rotarians attended a pancake breakfast held at the Orange Senior Center on March 27, 2010, benefiting the Center and students in the Masters program in International Studies at Chapman University. The event was organized by the Chapman student and Center officials. A live band played and attendees had the opportunity to win one of many donated prizes. Following breakfast Orange Sunrise Rotarians received a tour of the facility from Executive Director Tom Maldonado. Orange Sunrise is looking for innovative ways to support the center by purchasing needed items or providing materials and labor for Center improvement projects. Pictured: The organizing committee. The event was well attended and a great mix of young and old! This entry was posted in Community Service, Just for Fun! on March 27, 2010 by Rae. Orange Sunrise Rotary hosted members of the Rotary Clubs of Orange and Villa Park as each club supported a contestant in the annual District 5320 Speech Contest. Maia Kinnebrew represented Orange Sunrise Rotary, while Mary Haithcoat spoke for Orange Rotary and the Rotary Club of Villa Park sponsored Bri Baeyens.Maia won the area event, earning the right to compete at the District finals, to be held April 17, 2010 at the Sycamore Center in Lakewood. 1st place winner Maia Kinnebrew, 2nd place Mary Haithcoat, 3rd place Bri Baeyens, area speech contest, March 25, 2010. This entry was posted in Vocational Service, Youth Service on March 25, 2010 by Rae. 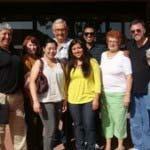 In March of 1985, the Rotary Club of Orange sponsored a new breakfast club, the Rotary Club of Orange Sunrise. Now one of three Rotary Clubs in the City of Orange (along with Orange North), Orange Sunrise has matured, but has never “grown up”. Orange Sunrise remains young and young at heart. Current membership includes several members in their 30s and parents with small children. To respond to the needs of our young members, OrangeSunrise moved to a “happy hour” meeting time in 2007, slashed meal costs and began a one-hour meeting format. All members enjoy the fun, family atmosphere. Orange Sunrise continues its tradition of service to our community and world, supporting our schools and providing our vocational expertise and labor on home building and refurbishment projects locally and in Mexico. In our club’s history, we have provided more than 15,000 books to Orange school children, financed eye surgeries, hearing aids and cleft palate surgeries in Mexico, raised thousands of dollars for The Rotary Foundation and awarded dozens of scholarships to local vocational programs and international studies applicants. We are proud to sponsor the El Modena Interact Club at El Modena High School and we send 3 or more students every year to the Rotary Youth Leadership Awards camp. As we head into our second 25 years of service, we expect to continue as sponsors of the Annual Orange Plaza Car Show, which funds our service projects locally and overseas. Thank you to all of our current and past members for your service to Rotary and to our many non-Rotarian volunteers and friends! There is always a place for you at our table, at one of our service projects, at our car cruise nights, or at one of our many parties. Because as you know, It is Always Sunrise Somewhere. 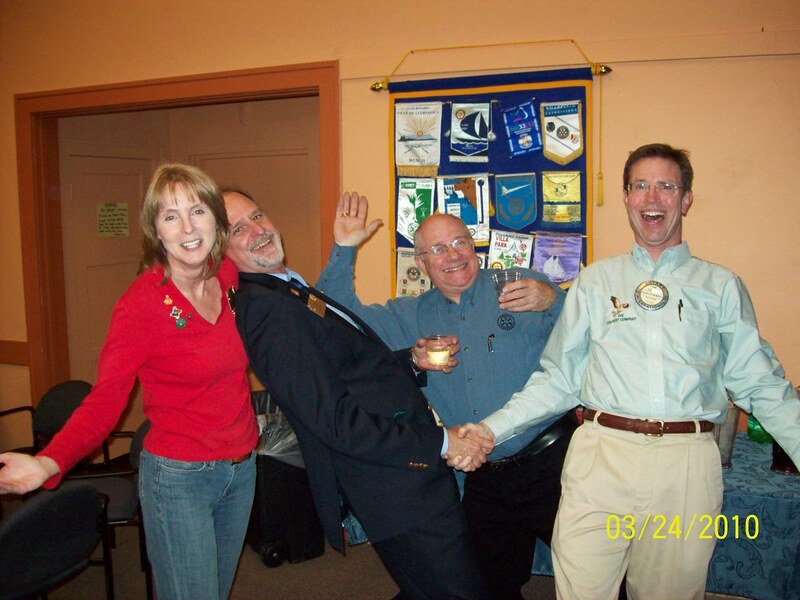 The dignified President of Orange Sunrise, Rae Shirer, with the equally sedate District Governor Bret Gerdes, PDG Grant Engle and Orange Sunrise Rotarian Tim Hufler celebrate the 25th birthday of Orange Sunrise Rotary. For more photos, visit us on Flickr! This entry was posted in Club Service, Just for Fun! on March 24, 2010 by Rae. The Rotary Clubs of Orange, Orange North and Orange Sunrise held the 36th Annual Orange Police and Fire Recognition Awards on March 4, 2010 at The Villa in Orange. The three clubs work together to plan this annual event. Representatives from the Orange County Board of Supervisors, State Assembly and State Senate attend, as well as all members of the Orange City Council. These groups honor the Police and Fire personnel, who are presented with plaques of recognition by the Rotary Clubs. The crowd of more than 150 was entertained by singer Robbie Britt before awards were presented by Fire Chief Bart Lewis and Police Chief Bob Gustafson. The event was reported in the Orange County Register and the article can be found here. 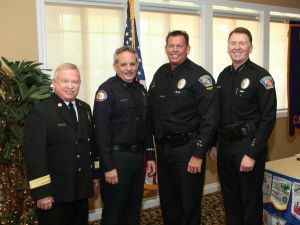 Left to right: Fire Chief Brad Lewis, Firefighter of the Year Captain John Karell, Police Officer of the Year- Motor Officer Brent Taylor, and Police Chief Robert Gustafson. This entry was posted in Community Service, Vocational Service on March 4, 2010 by Rae. Orange Sunrise Rotary is collecting books for the District 5320 Children’s Book Drive. Books were collected at every March meeting and will be collected throughout April, even at the 16th Annual Orange Plaza Car Show! Teri Snyder with a small number of the books collected during our Spring 2010 Childrens Book Drive. Several boxes of new and gently used books have already been delivered to the District collection center for donation to the Early Literacy Project and other local programs. So bring in those books! This entry was posted in Vocational Service, Youth Service on March 1, 2010 by Rae. Orange Sunrise members collected and donated more than five large boxes of paper, card stock and other art materials to The Learning Experience, an organization serving grade school students and operating a full program for Kindergarten students. As with all schools, both public and private, funds for art project materials are in short supply. 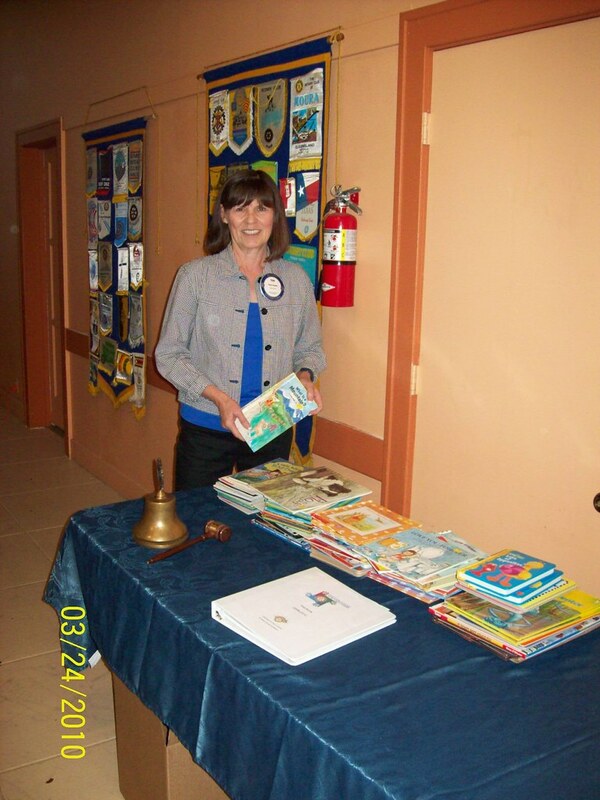 The paper drive was held at our regular meeting on February 24th and club member Teri Snyder delivered the materials to The Learning Experience. This entry was posted in Community Service, Youth Service on February 24, 2010 by Rae.